For nearly a decade the Washington Capitals have had to wear the moniker of being “next year’s champions”. The Caps have won three Presidents’ Trophies during this span, but they could never win the Stanley Cup Title in order to proclaim themselves as the best team in the National Hockey League. And being that the Capitals would consistently come up short versus the Pittsburgh Penguins and center Sidney Crosby in the Stanley Cup Playoffs, the criticism was mounting for them and their leader in left winger Alex Ovechkin. So this year when the playoffs rolled around the Capitals were once again one of the top seeds in the Eastern Conference after they had won the Metropolitan Division for the third consecutive year. However it looked like it was going to be short trip to the playoffs after the Caps lost their first two games of the postseason at home to the Columbus Blue Jackets. But Washington would find a way to dig themselves out of the series hole as a double-overtime victory in Game 3 would propel them to win the series in six games. 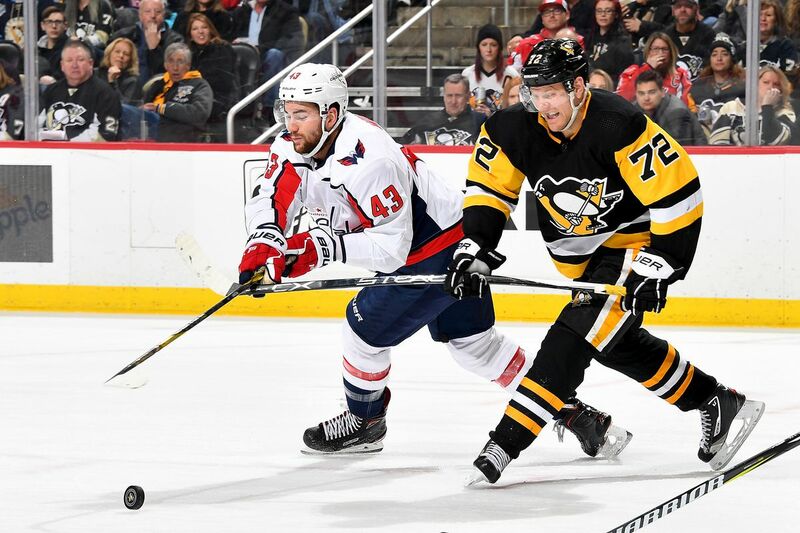 The second round would see the Capitals clash with an old playoff nemesis in the Penguins, and after Pittsburgh won Game 1 in Washington, it appeared to be deja vu all over again. But just like it had been in the first round versus Columbus, the Caps would get back on track and a 2-1 overtime victory in Game 6 allowed them to exercise some demons as Ovechkin and company finally found a way to get past Crosby and his crew. And after Washington was finally able to defeat Pittsburgh in the postseason, there was no choice for them, but to go all the way. That mettle would be tested in the Eastern Conference Finals versus the Tampa Bay Lightning as after Washington won the first two games of the series on the road, they would drop the next three. The Lightning took the ice in D.C. for Game 6 looking for their second trip to the Stanley Cup Final in the last four years. However a pair of goals by right winger T.J. Oshie, and 24 saves by goalie Braden Holtby would change that narrative as the Caps were able to force a decisive Game 7 by winning 3-0. Things would not change for the Lightning on their home ice for Game 7 as Holtby once again stonewalled their offense; this time with 29 saves which propelled Washington to a 4-0 victory, and their first berth in the Stanley Cup Final appearance in 20 years. In the Stanley Cup Final, the Capitals would meet the feel good story of this National Hockey League season in the Vegas Golden Knights. The Golden Knights became the first expansion team in NHL history to reach the Stanley Cup Final in their first year of existence, and they were looking to cap a story book season by taking home Lord Stanley’s Cup. The entertainment capitol of the world set out to put on a show ahead of Game 1 as all that was missing from the T-Mobile Arena was Wayne Newton, or Mariah Carey performing. The Caps and Golden Knights would go back and forth in Game 1, but it was Vegas who found a way to triumph as they would win 6-4. But little did we know that this would be the last victory by the Golden Knights for the season as they would be shut down by a Capitals onslaught. After Vegas scored six goals in the first game of the series, they were limited to just eight over the final four contests. Over the final four games Holtby racked up 122 saves to neutralize an offense which was fifth in the National Hockey League in scoring this past season. And with the offense of the Golden Knights unable to crack the Holtby code, Washington moved in for the kill. It was a team effort for the Caps as in the series Ovechkin and right-winger Devante Smith-Pelly each scored 3 goals, while center Evgeny Kuznetsov chimed in with 7 assists with center Nicklas Lindstrom getting 6. This wasn’t the Capitals team that we had grown accustomed to seeing as their resilience showed throughout in the postseason. In the past the Caps would have folded after losing the first two games of a series at home, while they would have also folded up shop against Pittsburgh. And there was no way that the Caps would have been able to go on the road and secure a victory over the Lightning in Game 7. These Capitals knew how to seize the moment, and for all of those who’ve seen them blow a 3-1 series lead in the past, they closed out the Golden Knights in their arena in order to bring Lord Stanley’s Cup to the nation’s capital for the first time. 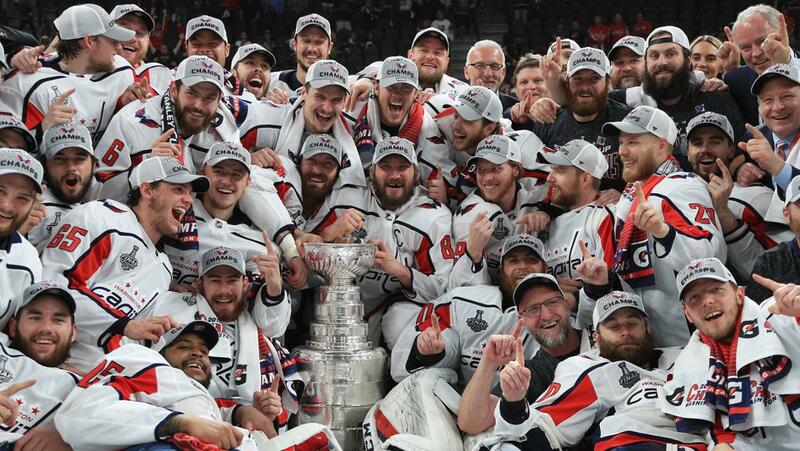 These Capitals truly earned the title as Ovechkin, Holtby, Backstrom, Kuznetsov, defenseman John Carlson, center Jay Beagle, and defenseman Dmitry Orlov who have had to carry the burden of past Washington teams who were unable to get it done in the playoffs were finally able to savor that moment of skating around the ice hoisting the most coveted trophy in the National Hockey League. After being fired by the Nasvhille Predators in 2014, Barry Trotz was hired to be the head coach who would lead the Capitals to the mountain top. And like his players, Trotz had to eat those playoff losses as he was look as just another head coach who couldn’t get it done. However things clicked for Trotz this season as there was a an extra dose of hunger which was associated with this Capitals team this season, and as the old adage goes, the wolf that is climbing the mountain is always hungrier than the one who is already there. That new found hunger and sense of urgency is why the Capitals are now Stanley Cup Champions as they found a way to score the timely goals, while also making the key defensive stops in crunch time. Barry TrotzSo now D.C. is set to party like they have not in a very long time. Of the four major sports in North America, you have to go back to 1991 to find the last time that a D.C. area team won a title when the Washington Redskins won Super Bowl 26, while Ovechkin’s career has come full circle. Ovi had all of the individual accolades that would cement a Hall of Fame career which includes being a three-time Hart Memorial Trophy winner as the National Hockey League’s MVP, while also tallying 607 career goals to go along with 515 assists. And when NHL commissioner Gary Bettman announced that Ovechkin received the Conn Smythe Award as the MVP of the Stanley Cup Playoffs, it was the cherry on top for the greatest season of his career and that of the Caps. So now Washington gets to enjoy a summer with the Stanley Cup, while they must accept their new role as being the hunted heading into next season. But anyway that you slice it, this was truly worth it as after traveling all over the United States and Canada, Lord Stanley’s Cup will be finally on display in Washington D.C.